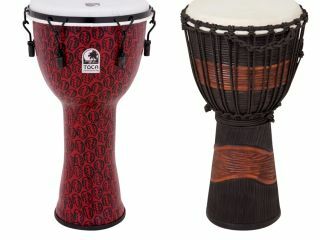 NAMM 2011 PRESS RELEASE: Toca's original Freestyle Djembes set the bar for great sound from an affordable lug-tuned drum with a natural skin head. Freestyle II Mechanical Tuned and Freestyle II Rope Djembes now take the next step in performance with the installation of all-weather synthetic heads. The new heads eliminate the stretching, drying and loss of pitch that can occur with natural skin heads due to changes in weather conditions. Thus they offer greater consistency in sound. Synthetic heads can also be tensioned over a wider range, making them able to produce higher, crisper slaps and deeper bass tones. Freestyle II Mechanical Djembes have also been improved with an extended collar hoop that allows for easier tuning over a greater range, and rubber tips on the tension bolts protect the player's clothing. Meanwhile, the drums' lightweight and durable synthetic shells offer outstanding resonance and projection. They're available in 9", 10", 12" and 14" head sizes in a choice of Red Mask or Gold Mask finish, and each features a protective non-slip rubber bottom. The 14" model comes with free carrying bag. Freestyle II Rope Djembes have also been improved with an increased number of rope runners that allow for improved tuning. The drums' lightweight and durable synthetic shells offer outstanding resonance and projection. They're available in 9", 10", 12" and 14" head sizes. Each features a rich, dark red finish and a protective non-slip rubber bottom. The 14" model comes with free carrying bag. Traditional sound…high-tech construction...state-of-the-art performance. You get them all with Toca's Freestyle II Djembes. The term "street" has come to refer to something real… something natural. Such is the case with Toca's new Street Series Djembes. The "street" element of these drums comes in their organic nature. Each shell is carved from a single piece of environmentally friendly plantation-grown mahogany wood. Twenty coats of teak oil are then applied to the shell to protect and preserve the wood. Each drum comes fitted with quality goatskin heads and a traditional rope tuning system. The result is an instrument that sounds as earthy and natural as it looks. Street Series Djembes are available in small, medium, and large head diameters (approximately 8", 10" and 12" respectively) in a choice of Cherry Stain or Brown & Black Stain finish. Best of all, they come at drummer-friendly "street" prices. If you're looking for great value in a djembe, hit the Street… and then hit the stage.